After declining for 150 years, vocal virtuosity is on the upswing. In particular, 25 years ago few tenors sang roulades or high Cs. The number who do is steadily burgeoning, though their singing sometimes lacks personality, passion and charm. The differences between Nicola Monti on a Melodram recording of a Naples performance of La cenerentola in 1958 and Francisco Araiza on a CBS studio recording of the opera from 1980 are representative of the typical differences among tenors—I’m tempted to say singers—then and now. Monti is sunny and ingratiating, his mezza voce caressing. But he omits the trills, smudges the coloratura at conductor Mario Rossi’s fast clip and sounds uncomfortable upstairs. The technical demands are beyond him and his range is simply too short: had the more difficult and high-flying passages not been cut, he probably would have been unable to sing the part. Araiza sings it uncut, hitting all the notes—except the trills, which he too avoids. He has marvelous agility and velocity, and the high Cs hold no terrors. But, however proficient, he is charmless and mechanical. I have found no evidence that anyone in Rossini’s day produced his tone like Araiza, with the locus of resonation far forward in the face. Compared to such turn-of-the-century interpreters of Almaviva in Il barbiere di Siviglia as Fernando De Lucia and Alessandro Bonci, Araiza is uninspired in his treatment of rhythm. Their singing abounds in rubato; his is comparatively four square. Until recently, the music of every composer was interpreted in accordance with the performance practices not of the composer’s time but of the interpreter’s. De Lucia came of age musically around 1880, at the height of the Romantic era. His liberal use of rubato suggests Barbiere or, even more, La sonnambula had been composed then. His recordings, “Son geloso” in particular, challenge us to decide how literal one should be in construing Bellini’s tempos and rhythms. Did Bellini assume that a singer would use rubato so extensively? Did Bellini intend him to? Is De Lucia simply emphasizing romantic tendencies in Bellini’s music or is he adding something extraneous? Does the music benefit from his approach? Is he inspired or wayward? Where are the boundaries? De Lucia is inquiry stimulating. Bonci, no less sensitive to the music, is less extreme in his liberties—as is his successor Dino Borgioli. Araiza is probably the best recent Belmonte, in Die Entführung aus dem Serail. At a 1984 performance at The Metropolitan Opera, he hit most of the notes dead on, with big, bright tones so well focused as to make intonation lapses more noticeable. In the notoriously florid “Ich baue ganz,” he was accurate in the stepwise passages, less so in the arpeggiated ones. He interpolated both a small cadenza before the repeat of the main theme and some ornamentation in the repeat itself—as well as a few extra breaths. He pronounced German well (unusual in an Hispanic singer) and acted energetically. But his singing was more impressive than beautiful. And he wasn’t very interesting: His dynamics were sometimes random, sometimes inert. He failed to emphasize melodic climaxes and to distinguish melody from ornamentation through volume or accentuations. He sang with little tenderness and was boring in tender passages. He hardly ever shaded his tone and managed to be vigorous yet dull. Singers sustain interest in many ways, interpretation and temperament among them. Luciano Pavarotti does so through charisma; Tito Schipa, through charisma, charm and musical sensitivity; Giuseppe Di Stefano, through passion and feeling for words; Enrico Caruso, through warmth and emotion. Araiza isn’t endowed with an extraordinary supply of these qualities. On a recording of lirico-spinto warhorses made in 1986, he relies instead on musical effects, such as contrasting soft singing with loud. His interpretations of the album’s two Puccini pieces, “Che gelida manina” and “E lucevan le stelle,” are satisfying, for in addition to alternating dynamics, he does sing with some tenderness and fervor. But in the aria from Eugene Onegin, one misses Dmitri Smirnoff’s plaintive quality, his wistful yearning. In the Arlesiana aria, Araiza lacks both bitter melancholy for the opening and desperation and slancio (surge, oomph) for the end—as well as vocal punch and core on the high As, where the voice is unassertive and veiled, particularly on dark vowels (ah, oh, oo). Perhaps the recording’s most underinterpreted selection is “Ah! fuyez, douce image” (Manon), where he sings as if he hadn’t considered the importance of the notes in relation to each other or thought about which leads ahead to which. In the middle voice he produces a strong round tone, but he doesn’t imbue the high B-flats with longing, pleading or desperation, nor is he able, in the alternative, to trumpet them forth; however, on higher notes, such as the Bohème aria’s C or the interpolated high D at the end of “Possente amor,” the voice takes on brilliance. Stylistically he is an anomaly: a latin singer with a German sound who achieves legato in the German manner since the 30s—almost without portamento. The music on the record, mostly from the late 19th century, was first performed by singers who used portamento generously. Araiza is never tasteless. At his worst he is earthbound, offering conscientious observance of interpretation markings in the score without going beyond them. At his best he is an excellent singer who just misses striking sparks. Since 1983 he gradually has undertaken more dramatic repertory although he has said it may force him to abandon high parts. Having already performed Rodolfo, Faust and Lohengrin, he is scheduled for Chénier and wants to do Alvaro, Carlo, Manrico and Max. He succeeded in florid repertory by virtue of technical prowess. In dramatic parts, however, his relatively bland vocal personality probably will tell against him. Further, he might produce a more heroic sound at the expense of vocal gleam. On a recent recording of Maria Stuarda, his tone is brassier but also thicker and coarser—the classic tradeoff. This article, written in 1990, is reprinted from The International Dictionary of Opera and The St. James Opera Encyclopedia, with additions and minor changes. Born October 19, 1900 in Cossebaude, outside Dresden, Erna Berger traveled with her parents to Paraguay after WW I. In 1924 she scraped together enough money to return to Germany, where she studied voice with Herta Boeckel and Melitta Hirzel, in Dresden. In 1925 she was engaged by Fritz Busch for the Sächsische Staatsoper there, making her debut as a Knabe in Die Zauberflöte. In 1928 she appeared there in the world premiere of Strauss’s Die Ägyptische Helena and in 1929 made her debut in Berlin’s Städtischen Oper (now the Deutsche Oper Berlin), in Hans Pfitzner’s Christelflein. Toscanini engaged her for the Junger Hirt in Tannhäuser, for the 1929 Bayreuth season, after which she sang the Erste Blumenmädchen and Waldvogel there. In 1932 she debuted in Salzburg, as Blondchen. In 1934 she joined the Berlin Staatsoper, where she continued for 30 seasons. 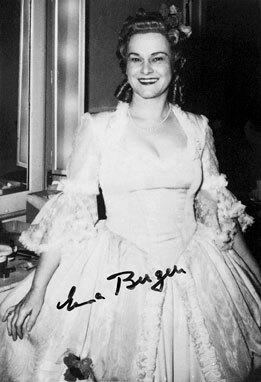 Making her Covent Garden debut in 1934, where she returned in 1938 and 1947, in 1949-50 Berger sang at the Met, opening the season as Sophie, also appearing as Gilda, Der Königin der Nacht, Rosina, Woglinde and Waldvogel. After the war she gave concert tours in North America, South America, Australia and Japan. In 1960 she became a professor of singing at Hamburg’s Musikhochschüle and published her autobiography, Auf Flügeln des Gesanges. Erinnerungen einer Sängerin. (1) She died June 14, 1990 in Essen. A street in Dresden was renamed in her honor. According to the Tosca film credits, Sciarrone is one Aldo Relli. This is the stage name of Ubaldo Corelli, Franco’s brother. One might think, here is a typical case of nepotism: the famous tenor bringing in some family. Instead, it was the other way around. Ubaldo, a good baritone, had graduated from the Santa Cecilia Conservatory and was taking his career rather easy. He had been comfortably singing small roles for a number of years when he was chosen for Sciarrone. Ubaldo heard that Carmine Gallone was looking for a good-looking young tenor to act Cavaradossi. The director’s intention was to have Ferruccio Tagliavini record the music. Ubaldo, who was friendly with Gallone, showed him a photo of his “baby brother.” Not only was Franco handsome, but, Ubaldo insisted, he also was very good at singing. Gallone met the young tenor—and that is how Franco Corelli came to be cast as Cavaradossi. Gifted with a powerful, resonant and biting voice, Robert Merrill is supposed to have quipped, “When in doubt, sing loud.” In fact, he almost never sang any way but loud. He had a plangent sound but frequently sang as if by rote, failing to communicate rhythmic pulse, much less musical ebb and flow or feeling for drama in music. For him the basic unit of utterance was the note, not the phrase. The notes themselves stayed more or less at the same volume and thus lacked dynamic direction. As a result he couldn’t prepare emphases with crescendos. This, combined with his tendency to treat legato passages as if they were declamation and to substitute bluster and cliched snarls for emotional substance, caused much of the music he sang to sound jagged. Nevertheless, his legato was excellent, for he was able to join notes together seamlessly (unlike many Americans who habitually disrupt legato passages with sudden, quick diminuendos before the consonants d and t). Gertrude Pitzinger (1904-c. 1996), contralto, was born in Mährisch-Schänberg (Krásná Hora), in what became Czechoslovakia. After teaching school, in 1926 she received a diploma from the Vienna Music Academy, in music teaching. She studied lieder with Julia Culp. Pitzinger sang her first concert in 1929, in Olmütz (Olomouc), Czechoslovakia. From 1935 until World War II she gave concerts in Austria, Denmark, Italy, Norway, Holland and Belgium. In 1937 she sang in Beethoven’s Ninth in London under Furtwängler, and she appeared in 1938 at Carnegie Hall and The Town Hall, New York. In 1937 and 1941 she performed in Prague; 1941 brought her to Holland. Until 1940 Pitzinger could be heard regularly in concerts and lieder recitals in Berlin. At the Salzburg Festival she sang, among other things, Dvorák’s Stabat Mater, 1934, Mozart’s Requiem, 1951-1959, Beethoven’s Missa Solemnis, 1955-1957, and Handel’s Judas Makkabäus, 1953. She particularly was known as a Bach interpreter. The Czechs viewed her as a collaborator, so in 1945 she had to leave her homeland and lived at first in Landsitz, in the Black Forest. After 1959 she was a Professor at the Musikhochschule, in Frankfurt am Main, and continued to give concerts. She was married to the Danish concert singer Otto Dupont. Later in life she became a personal friend of the American right-wing extremist Lyndon LaRouche and his wife, the German Helga Zepp-LaRouche, heads of the German political party Patriotten für Deutschland. Pitzinger’s recordings are on Amadeo, Quadrigafon, DGG (Mozart’s Requiem, Bruckner’s Te Deum, lieder) and on BASF (Brahms lieder). The above essay was excerpted from the booklet to Great Conductors of the Third Reich: Art in the Service of Evil. Tito Schipa’s was the most lyrical sensibility of them all, the most elegiac, sublime and endearing (with the exception of Giuseppe Anselmi). Schipa’s singing was conversational in its intimacy. He reconciled the conflicting demands of legato and diction so as to excel at both. No Italian tenor on records has imbued words with more significance. Since Fernando De Lucia, Alessandro Bonci and Dino Borgioli, no Italian tenor has equalled Schipa’s expressive use of rubato (taking time from one note or group of notes and giving it to others). He composed songs and an operetta, conducted orchestras, spoke a number of languages and wrote an autobiography. I studied with Schipa but subsequently took my singing in a different direction. His real legacy is his records and films, of which I Sing for You Alone is the first of ten full-length features. (The film also was released under the title Three Lucky Fools.) Particularly before dubbing was introduced, in 1935, it was not unusual to shoot several versions of the same film, each in a different language, with many variations in detail, including supporting casts. Schipa also made I Sing for You Alone in Italian as Tre uomini in frac (of which no prints appear to survive) and in French as Trois hommes en habit (#655). He sings some songs in French in the French version that are in English in the English version. Had Schmidt had his way Ein Lied geht um die Welt would not have been made, at least as it stands. He had objected to the plot, which revolves around his short stature (in reality, five feet), but the director, Richard Oswald, convinced him to go ahead. The part of the film that deals with Schmidt’s radio career also is based on his life: When he came to audition for Berlin radio, in 1929, they looked with amusement at this “midget” and asked what he wished to sing. “Whatever you want,” he replied. The pianist plunged in with “Di quella pira”–and Schmidt obliged. Jadlowker (whom he admired) had become too expensive for a radio Idomeneo. Schmidt sightread the principal aria, “Fuor del mar.” The result: his radio debut as Vasco da Gama, in L’Africaine. Prior to April 1, 1933, when Hitler prohibited Jews from appearing on the radio, Schmidt broadcast nearly every week, including 42 remarkably disparate operas: La Muette de Portici, Robert le diable, Guillaume Tell, Louise, Idomeneo, Dinorah, Dom Sébastien, Il trovatore, Jean de Paris (Boïeldieu), I vespri siciliani, Benvenuto Cellini, Bánk Bán (Erkel), Don Carlos, La fanciulla del West, I masnadieri, Salome (in which he sang Narraboth), Le Postillon de Longjumeau, I due Foscari, Mefistofele, Boris Godunov, Semiramide, Euryanthe, L’elisir d’amore, Un ballo in maschera, Der Barbier von Bagdad and others; all were sung in German. Later, on Vienna radio he performed Il barbiere di Siviglia and I puritani, again in German.